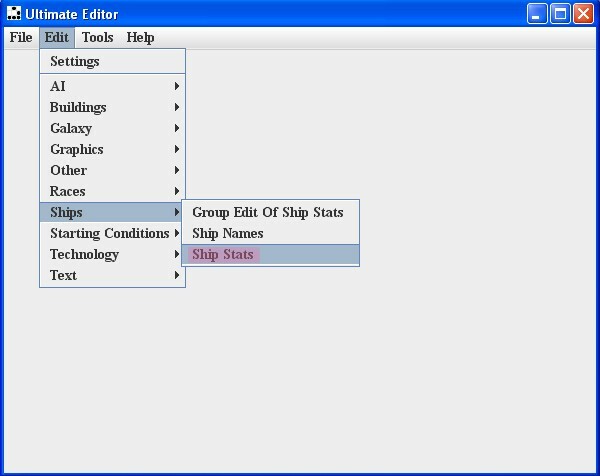 This is a tutorial for importing and exporting ship models using DCER's Ultimate Editor (UE). This is the screen we will be working with the most. first tutorial; How to do simple replacement. 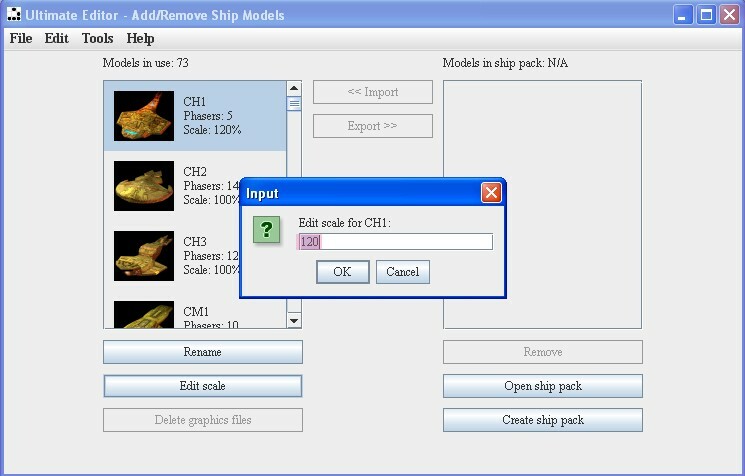 Select "Open Ship Pack" and locate the ship packs you have created or downloaded. Now just select the model on right you are wanting to import. And on left select the model you want to replace. And click on import. And save. NOTE; You may get a warning message that palette is over 127 if you get this message you will need to reduce palettes manully. if this is not done model will not display properly. Now, new model has been added and is using all the same info as the model you replaced. 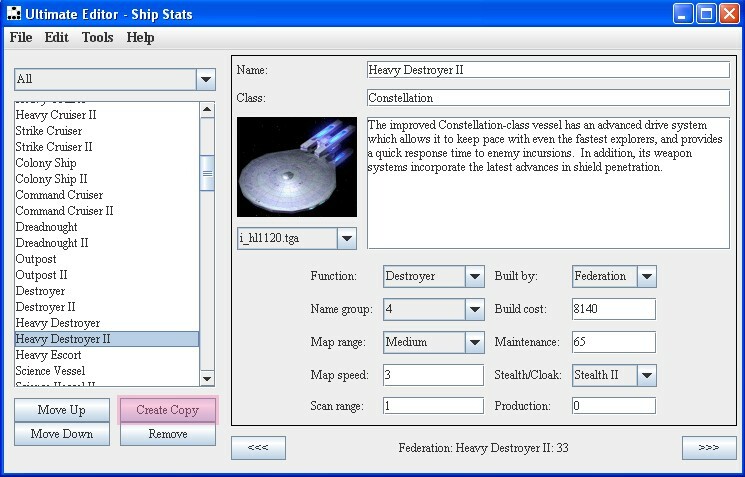 (ship stats, upgrades, cost, mantinace, ect) And should have no problem using and building this model in game. Second tutorial; Adding model using 2 models on same phaser slot. (Note: this all works the same if tring to put 3 models on same phaser slot). No model can share a phaser slot with any Vanilla models. There phaser slot numbers are random so errors would be common. 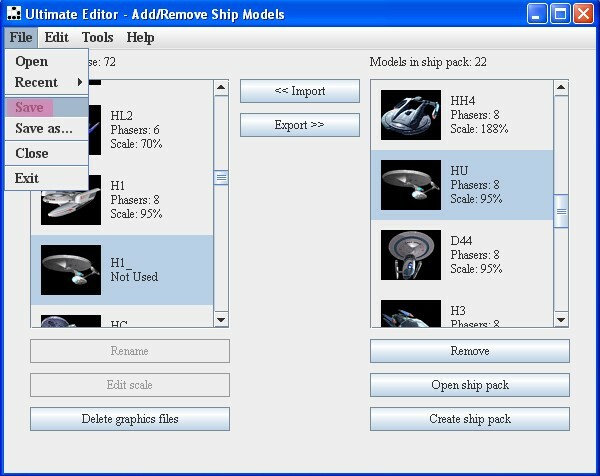 Before a ship can be imported both models (imported model and model selected to share phaser slot) must use same scale and amount of phasers. You must plan out what models you plan on using before making any changes. 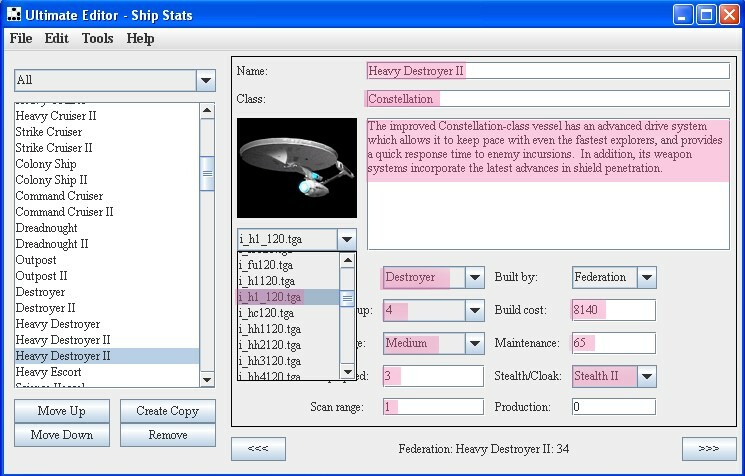 Using Oberth we just added this will be the slot that will be used for next model imported and will share phaser slot. Now you will see under renamed model "H1" and "Not used" spot named "H1_"
Next, I need the scale model to match scale for both models. 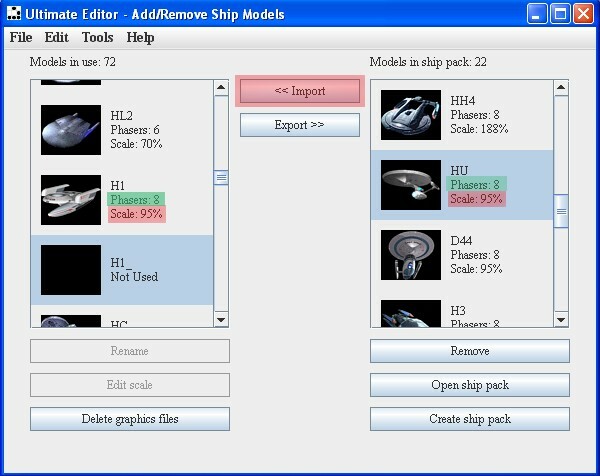 With the first model of shared phaser slot selected click on "edit Scale" In new window change scale to the same as model you plan on importing from Ship Pack. 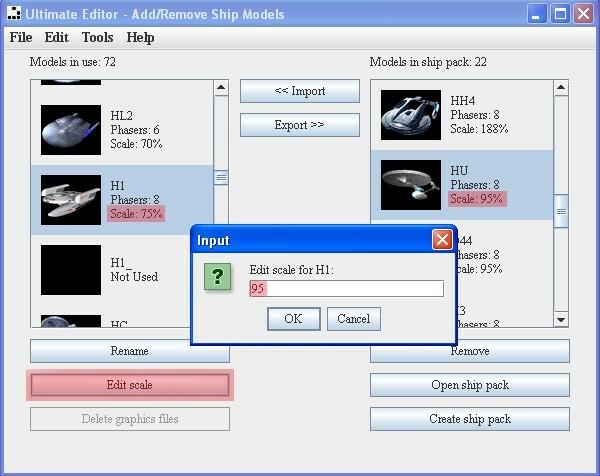 Now that phasers amount and scale match you can select not used spot "H1_" and model you want to import from ship pack "HU". And click on import. Now H1 model is in game working but H1_ model files are in game but model is not in uses. Note; you have also changed scale of H1 model from 75% to 95% so you could change scale as before to even out both models and split differance to scale of 85%for both models. 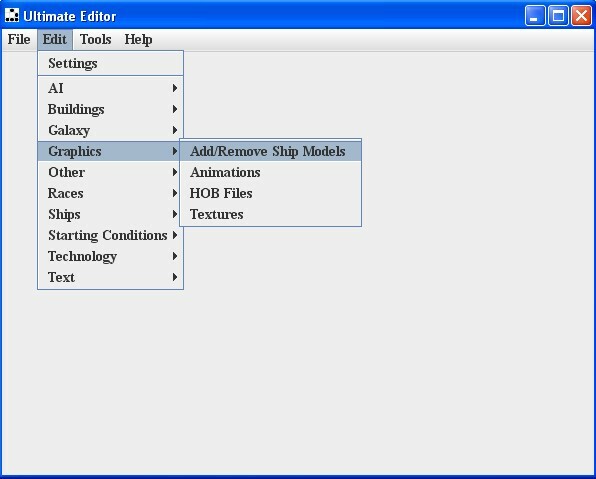 third tutorial; adding new not used model to shiplist. Example 1 "basic" using an upgrade slot. 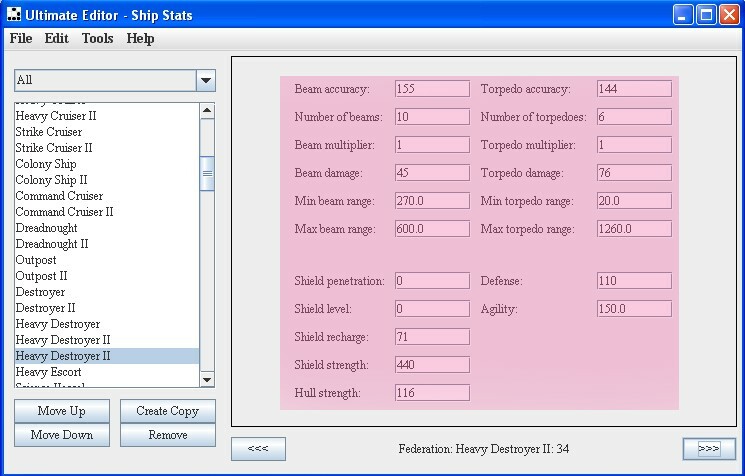 Open UE and open ship stats. Now select the slot you want to use and in dropdown list find the not used model you want to add. and edit name, class, and any stats and if it is an upgrade ect. Now you have 2 models sharing the same phaser slot and working in game. Select a used model that is close to the model you are adding then click on "Create Copy"
Next you will see an exact copy of that model. now it is time to edit everything. 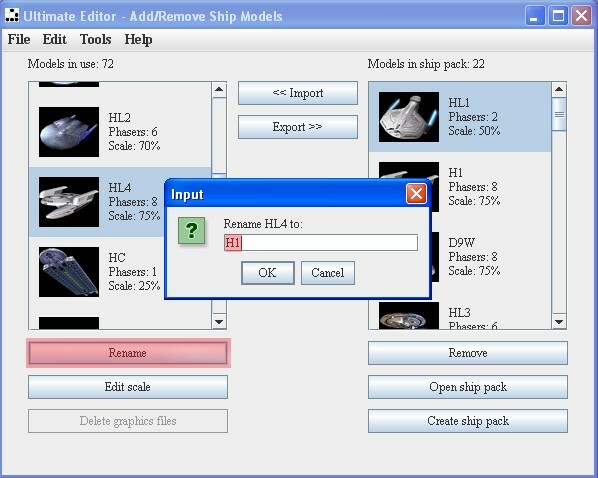 First open drop down menu and locate the new ship file you just added and select the tga file that use that model. And then edit all stats, so that model will be unique. Now you have increased shiplist and added a new model. 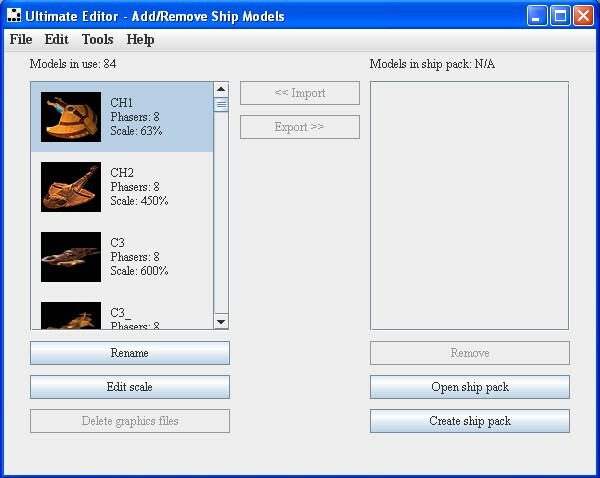 Fourth tutorial; How to edit ship scale. 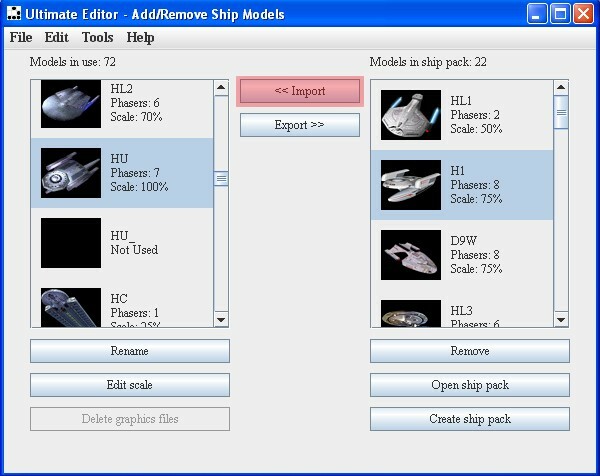 This is now a lot easier to do just go to Edit->Graphics->Add/Remove Ship Models then select the ship you want to edit scale on and select Edit Scale. In the new window change scale value to scale you want. now you have edited scale for that model. Fifth tutorial; How to change what ships are seen in screensaver. 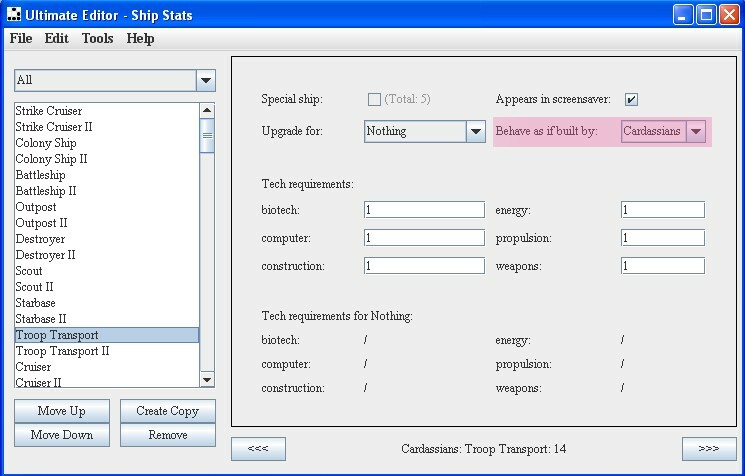 This also been made much easier to do go to Edit->Ship stats You will find a check box Appers in Screensaver Just check this box. 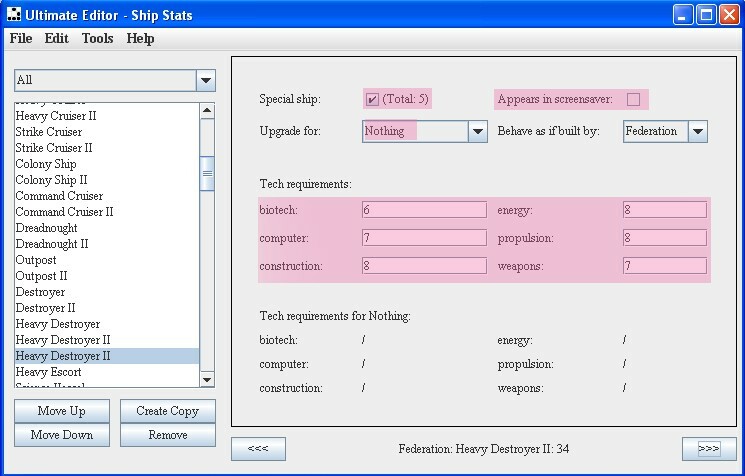 only catch is there is a limit to how many ships that can be used by screensaver so you might have to uncheck a model you do not want to see in screensaver. Sixth tutorial; How to uses of behave as if built by. This option will be rarely used by most people and has limited testing. UDMIII will use this to add assault command to all major races colony and troop transports by selecting built by Klingons. 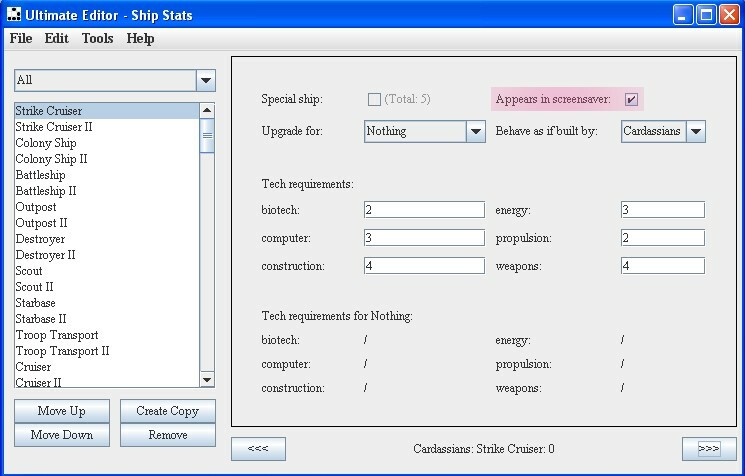 Sixth "a" tutorial; How to select What special ships are used. 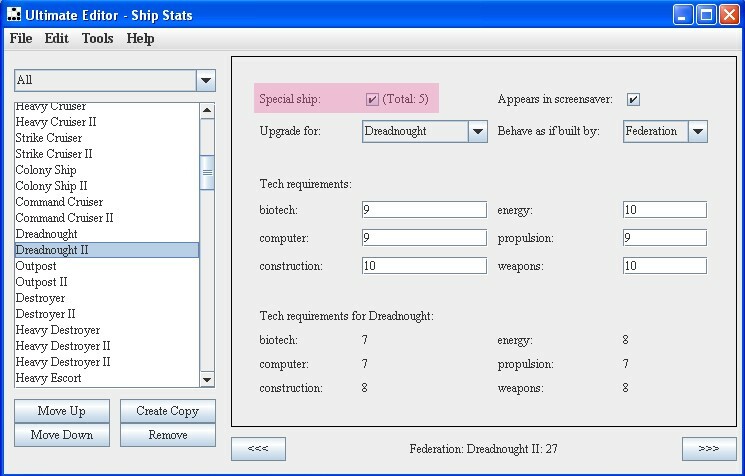 With the use of this option you can select what ships are considered special ships. 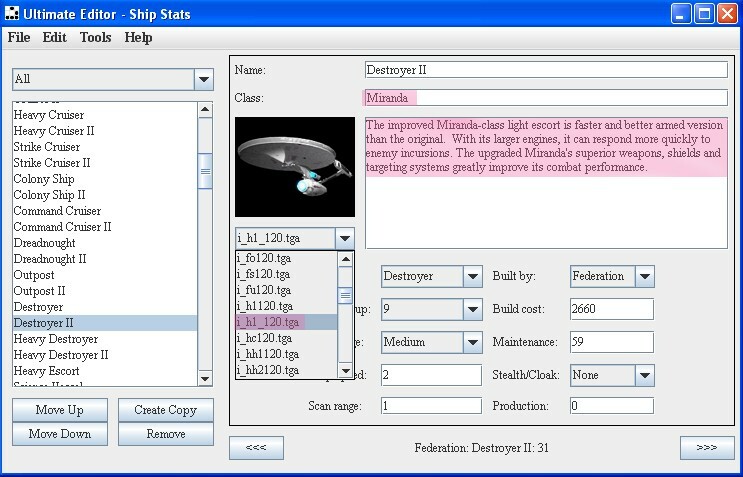 this was only for federation but with a little hex editing this also can be changed. for more info on how to edit read this post. Seventh tutorial; How to lower palettes used. this will reduce used palette from 119 to 102. By all races and minors using the same explosions textures. Download and unrar to location of your choice. Next open UE and add files to res file from editOtherFiles. 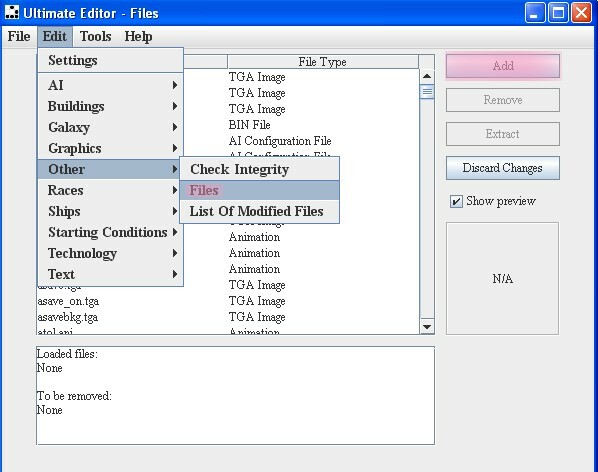 Next use add button and browse for the file you just downloaded. Then add all file from "gifs and hobs" folder. If you have made no changes to res file you can also add palette.lst from "vanilla palette.lst" folder. If you added palette.lst you are done. and save. 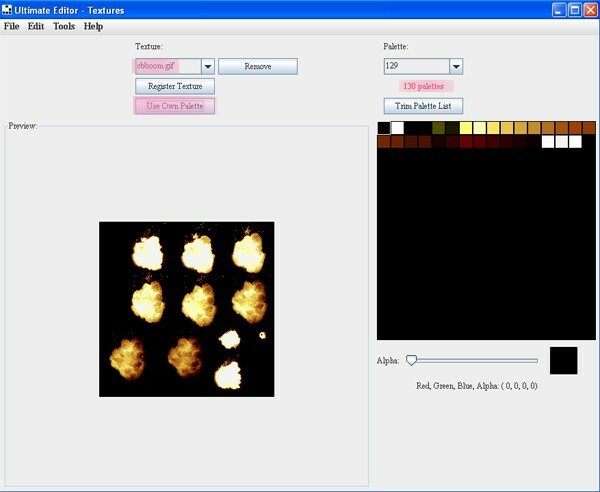 If you did not add palette.lst you will need to set palette for gifs. 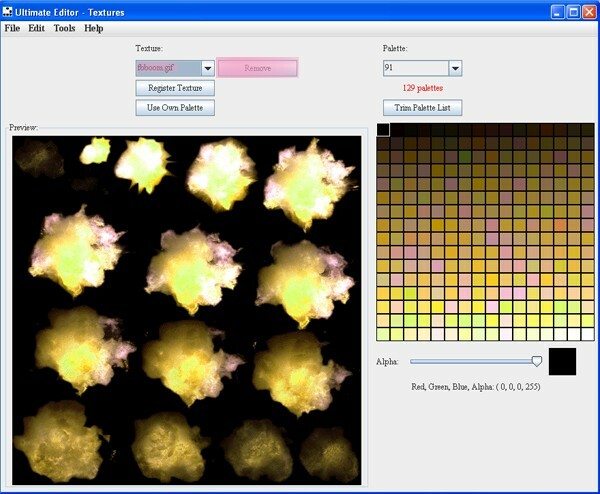 Next select cbboom.gif from drop down menu and select "use own palette"
next repeat last step with cgndexp.gif, csboom.gif, cshock.gif from drop down menu. Next select fbboom.gif and click on remove. next repeat last step for fgndexp.gif, fsboom.gif, fshock.gif, hbboom.gif, hgndexp.gif, hsboom.gif, hshock.gif, kbboom.gif, kgndexp.gif, ksboom.gif, mbboom.gif, mgndexp.gif, msboom.gif, rbboom.gif, rgndexp.gif, rsboom.gif, rshock.gif. 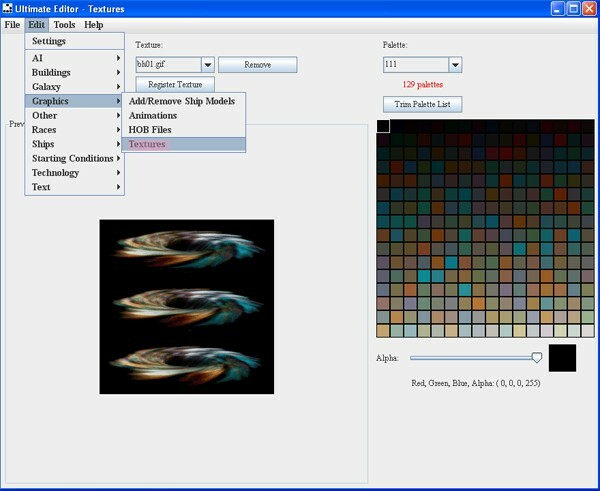 Next click on trim palette list and save.